The weekend is finally here, but honestly….it’s felt like a week long weekend! We’ve got snow and below freezing temps with wind chill and school has been closed all week. We’ve watched the movie Frozen more times than I can count and we’ve ate entirely too much junk food. It’s like Christmas break, all over again! Our Moms Check In team are talking about Indoor Activities for kids this week, because well, we’re all stuck inside with our kiddos, longing for warm days and sunshine!! I don’t see that in the near future though…just more snow and more cold temps for us. We’re sharing some of our fun indoor activities and kid-friendly recipes to cook up when you’re stuck indoors. Here’s how our Moms Check In moms are helping their kiddos fight the boredom this week! What do your kids do when you’re stuck inside? I’m not even gonna lie. Working from home full time, I do get to enjoy staying in my pajamas longer than I probably should. Heck…there are some days I don’t even get OUT of my pajamas. But, I do love to sport cute clothes. My style is very casual – but casual can be cute. A lot of moms that I know go through their frumpy stages and we need to get and STAY out of those ruts, right?! My Moms Check In group and I are sharing some cute mom fashions that are SUPER DUPER wallet friendly. Check them out below…you’ll be happy with the awesome styles and prices we’ve found through thredUP! It’s seriously insane!! Click here to see Amanda’s style and the details! Click here to see my style and the details! Click here to see Lindsay’s style and the details of her outfit. Click here to see Stephanie’s style and outfit details! 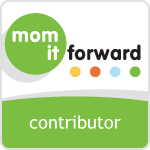 We’ve partnered with thredUP this week to talk about how fashionable moms can be. Click here to read more about thredUP and how you can get a FREE $10 credit. They offer name brand clothing, shoes and accessories for up to 90% off retail prices! We’d also love to invite you to the thredUP Twitter party we’re hosting! Please join us 2/19 from 1-2pm EST for a super fun Twitter party where we’ll be giving away lots of thredUP gift codes….even enough for the grand prize winner to buy a designer handbag. Click HERE to RSVP! One of my favorite things to do is eat. I can’t help. I just love food. The older I get though, the more I realize how much the extra weight I’ve put on is affecting my overall health. One little trick I’ve learned to help combat extra fat and calories, but still being allowed to eat my favorite things – is to make healthy swaps with my ingredients. Our “Moms Check In” crew and I are sharing some of our favorite healthy recipe hacks below. If your goal is to lose a few pounds while still eating some really delicious treats and food then you’ll love these! How do you spend your New Year’s Eve? Now that Christmas is over, it’s time to think about our plans for New Year’s Eve. Do you have any New Year’s Eve traditions? Do you normally spend it quietly at home with your family, or do you go all out and head out to the biggest New Year’s Eve bash? Our Moms Check In moms and myself have a few traditions of our own…..
Do you have special Christmas traditions? Maybe new Christmas pj’s or shaking out some reindeer food on Christmas eve?! We have all kinds of traditions, new and old. We try to keep up with the ones that both my husband and I grew up with plus we’ve added more for our own little family. Those traditions are what makes Christmas so special. Our Moms Check In moms are sharing their family Christmas traditions and we want to hear yours too, so make sure to leave us a comment with your own. You can find out more about Moms Check In and who we are below! Holiday entertaining can be so stressful. Honestly. Don’t we all already have enough to be stressed out about? Without the worries of cooking, cleaning, decorating, wrapping, shopping, and the list goes on and on! Our Moms Check In Moms have some useful tips – some that we hope will make your Christmas entertaining a little less stressful. What are your favorite holiday entertaining tips? Have you fired up your holiday baking yet? This time of the year, I can’t hardly drag myself out of the kitchen. I don’t much like to cook, but I love to bake and make candy. Especially THIS time of year! The Moms Check In moms and myself have put together an awesome list of 7 different and yummy Christmas Cookie recipes for you. Do you have a favorite Christmas cookie? Tell us the delicious details….drop us a comment! You can learn more about Moms Check In and who we are below. Click on the links below the photos below to get the recipe! I admit that I begin watching Christmas movies long before it’s even Thanksgiving. I would be satisfied watching them all year long to be honest, but then I guess they wouldn’t be as special come Christmas time. Do you have any Christmas movie faves? Myself and our Moms Check In moms are sharing our favorites plus we’ve rounded up the top 15 and linked to them in case you’d like to add them to your own physical Christmas DVD collection. We’d love to hear yours too, so make sure to leave us a comment sharing your favorites! You can learn more about Moms Check In and who we are below. Do you have any family Thanksgiving traditions? Every family is different and we all have different traditions. Maybe you’re looking to start a new tradition! We have such a large family, and it seems that now as the kids and grandkids are getting older, the traditions start to change but a few will always remain. Our Moms Check In moms and I are sharing our own family Thanksgiving traditions. We’d love to hear yours too! You can learn more about Moms Check In and who we are below. Looking for some of the best stain removal tips? Honest to goodness….sometimes it’s harder than heck to get stains out of clothes, especially kids’ clothes. I’ve learned over the years how to tackle some of the worst ones but it has always been trial and error. Between mud, dirt, grass and who knows what all else…well, you know. You’ve got kids too, right?! Here are some of the best stain removal tips from our awesome-sauce Moms Check In mommas! If you have any great tips, PLEASE leave them in a comment below! We want to hear them! P.S. We have an awesome Twitter party coming up next week with Dreft and you could win some awesome prizes. Make sure to RSVP below! – Sherry is a stay-at-home, homeschooling mom to two little ones and has been married to a wonderful man for the last fifteen years. Join her on her journey to celebrate family, rant about anything and keep it all positive. She writes about family, travel, recipes, kids, reviews & fun. Come, join her controlled (sometimes uncontrolled) chaos at Family Love, and Other Stuff. You can also find her on Twitter at @FamLuvStuff. Who are the moms of Moms Check In? We’re 4 moms who are also professional bloggers. We chat about a new topic each week. We talk about things from dirty diapers to date night, and everything in between. Moms love to talk to other moms and let’s face it…MOMS know everything!! If you happen to be a blogger also, and want to be a guest host one week, please fill out this form. What’s your best laundry stain removal tip? Dreft, Kandoo and Boogie Wipes are all working together this year with Scary Mommy to help feed 100 families this Thanksgiving. You can read more about the Scary Mommy Thanksgiving Project and find out how to get involved! You should also Follow Dreft on Facebook, Twitter and Pinterest to stay connected!! RSVP for the Twitter party below! Crunchy leaves, the orange/yellow/red colors on the trees, the crisp smell in the air. Ahhhh…..it’s fall ya’ll. It is my most FAVORITE time of year. I’m not sure why, but I just love everything about it. Especially the food. So many yummy recipes start appearing this time of year and one of my favorite ingredients is pumpkin! So that’s what we’re talking about this week! What’s your favorite pumpkin recipe? Our moms have shared some amazing pumpkin-y favorites this week too. Here’s what our “Moms Check In” moms think…. Drop your link to your favorite pumpkin recipe in the linky below for others to see! What’s your favorite comfort food? I’m willing to bet, that since you’ve landed on this post….it’s probably pasta! Am I right?! My husband could LIVE on pasta. I love it too, but he could seriously eat mac n cheese or angel hair pasta for breakfast, lunch and dinner ANY day. I know a momma is busy already, with kids wrangling her legs so dinner has to be easy at our house. If it requires too much work, then everyone will starve! This one pan pasta with chicken is our fave. Seriously. ONE stinking pan!!! Cleanup is a breeze. Oh, and if you have a hankering for mac n cheese, then you MUST try our homemade macaroni and cheese – it’s baked!! YUM! Oh my gosh! Did you know that October is National Pizza Month?! Pizza has to be my most favorite thing on earth to eat. We actually just had pizza for dinner lastnight. Don’t you just love pizz?? It’s just one of those foods that everyone loves because it can be made so many ways. Ooey, gooey, cheesy doughy PIZZA! Yum. I think I’ll go snag a piece outta the fridge leftover from lastnight. Cold pizza sounds like the perfect breakfast! Here’s what myself and our “Moms Check In” moms think…. What Do You Give Out to Trick or Treaters? So…spill it moms! What do you give out to trick or treaters? Do you pass out the good stuff or the stuff the kids roll their eyes at??? LOL!!! Did that sound harsh? I hope not!! But you know EXACTLY what I mean!! Even as a kid yourself, you knew which houses to hit because they passed out the good stuff. I’m also one of “those” moms. The moms who raids the candy buckets for the “good stuff” after kiddo goes to bed. Shhhh!!! Ohhh, and heads up, next Thursday (10/16) from 1-2 PM we will be having a Twitter Party with UNICEF and HSN! There will be some pretty amazing prizes – over $300 worth! Be sure to RSVP here! #EasyToGive #UNICEF will be the hashtags used, so make sure to follow along on Twitter! Oh yeah! Here’s what our #MomsCheckIn moms hand out to their trick or treaters! We usually go trick or treating and don’t pass out candy but the times we do, I usually pass out the good stuff. The Reese’s, and other yummy candy bars because those are my faves. Keeping my hands out of the candy bowl is a challenge. We give out candy, and sadly it’s usually candy that I like so I munch on it before Halloween…which usually means I need to go buy another bag before the trick-or-treaters get here. You’d think I’d learn my lesson, but apparently not. Those Reese’s Peanut Butter Cups just cannot be denied! When I was a kid it was a big deal to get mini chocolate bars for trick or treat so that’s what I give out. I may or may not have to sample a few of them. Did you know that while your child is out collecting candy this year that they can be helping to save the lives of children around the world? Trick or Treat for UNICEF started in 1950 as a way for kids to help kids. Since then, children have taken UNICEF collection boxes (you can get one for free here) with them trick or treating collecting change for this amazing cause! Since 1950 children have raised over $170 million dollars while trick or treating! This year UNICEF has made fundraising even easier! In addition to taking the iconic boxes with you while trick or treating you also have the option of creating an online fundraising page. In just a few seconds, you can set up a Trick-or-Treat for UNICEF fundraising page to share with friends and family. The money you raise will help save and protect children by providing clean water, nutritious food, lifesaving vaccines and more. Because some kids need more than candy.